Acai Berry Blast - Diet Pill Reviews: Does Acai Berry Blast Really Work? Acai Berry Blast is a nutritional supplement designed to help dieters look and feel better. Utilizing the powers of its main ingredient, the all natural Acai Berry, Acai Berry Blast provides consumers with essential fibers, nutrients, proteins, minerals, and an array of additional healthy compounds. How Does Acai Berry Blast Work? 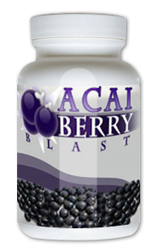 Acai Berry Blast contains a concentrated form of the highly popular Acai Berry. Naturally grown only in the Amazon Rainforest, the Acai Berry is a rare fruit that cannot be easily distributed to the global market, as the Acai Berry has an extremely limited shelf life. Due to the inability to ship the Acai Berry to consumers around the world, the creators of Acai Berry Blast have transformed the concentrated powers of the fruit to allow consumers to benefit from the Acai Berry in a supplemental form. According to the creators of Acai Berry Blast, consumers adhering to the dosage guidelines will experience increased weight loss results paired with a flatter and firmer abdomen / mid-section. Specifically, the creators of Acai Berry Blast assert that dieters will be able to lose up to 30 pounds while taking the supplements. Paired with these benefits, Acai Berry Blast should also help dieters more effectively flush out harmful toxins from the body, enabling dieters to feel healthier while appearing more youthful and slim.